We offer a wide variety of glaze options for all of our tiles including bright transparent gloss crackle, textured matte stoneware, shiny opaque, smooth satin matte, and many more. In fact, glaze research and reproduction is one of our specialties. This line of very bright, shiny glazes are transparent and crackled. They beautifully highlight our line of carved decorative tiles as they flow from the raised design and pool darker into the recesses. On our field tiles they flow and give depth and dimension where they pool darker. 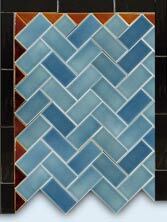 The color palette is based on traditional Victorian era tiles. 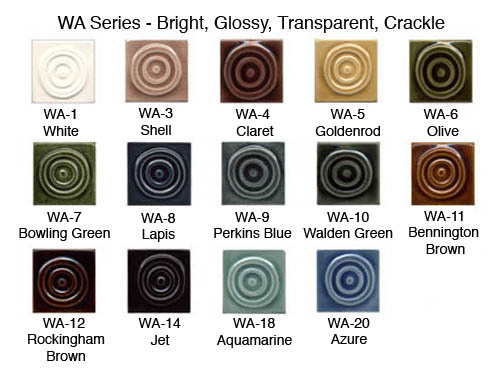 These glazes are designed for use on walls and such non-traffic areas as fireplace hearths. Expect a variation from dark to light in this series. This line of stoneware matte glazes range from smooth to textured. They work well on most of our carved decorative tiles, but expect to find some of the finer details slightly obscured. On our field tiles they give depth and dimension where they vary in tone and texture. This range of colors would be found on tradional craftsman era pottery and tiles. 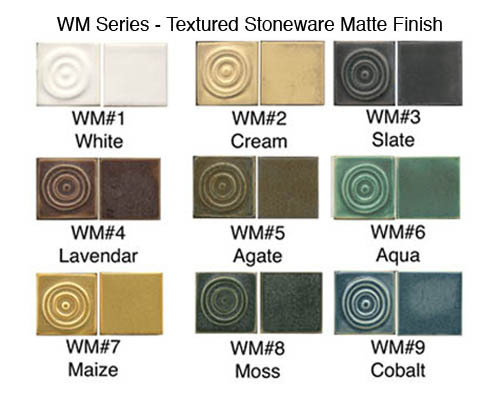 These are high fired stoneware glazes and are suitable for installation on all surfaces, including exteriors. Expect a variation in tone and texture in this series.